The elusiveness of Richard Tuttle's "Both/And" can be panic-inducing – until you remember that art doesn't always need a definition. Among Tuttle’s works that Kramer hated were wire pieces from the early 1970s. Here’s what Tuttle does to make a wire piece. First, he enters into a meditative state. He considers the nature of the line he is about to draw, in pencil, on the wall. Then, he draws a line in one fluid motion. Next, he takes a length of florist wire (thin, flexible wire) and tacks one end of the wire to the end of the line he just drew. Then, he unspools a length of wire and tacks the other end of the wire back to the wall where the line terminates. The wire dangles and bends and assumes its own shape. Then, there are two elements: a two-dimensional line drawn on a wall, and a three-dimensional length of wire that hangs, semi-sculpturally, off the wall. Actually, there are three elements, since the wire casts a subtle shadow. “Both/And Richard Tuttle Print and Cloth” at the Fabric Workshop and Museum, Philadelphia. Through Summer 2015. You can, this spring and summer, see some of Richard Tuttle’s wire pieces (along with many other works of Tuttle’s sculpture, drawing, printmaking and fabric design) at The Fabric Workshop and Museum in Philadelphia. The show is called Both/And Richard Tuttle Print and Cloth. It’s got five decades’ worth of Tuttle’s art. The title Both/And is a little bit of a joke, since the bulk of the exhibit comes from combining two exhibits that originated elsewhere. One exhibit was called Richard Tuttle: I Don’t Know. The Weave of Textile Language, organized by Whitechapel Gallery in association with Tate Modern, London; the other exhibit was Richard Tuttle: A Print Retrospective, at the Bowdoin College Museum of Art, Maine. 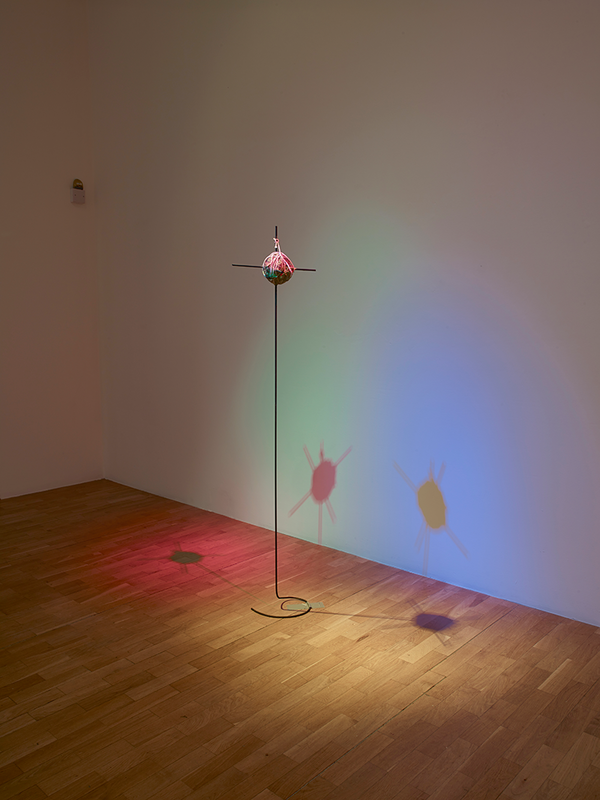 Richard Tuttle, Systems XI, 2012. Wood, stain, vinyl, cloth, paint, and metal. 41 7⁄8 x 71 x 46 inches (106.4 x 180.3 x 116.8 cm), overall dimensions variable. Courtesy of the artist, Pace Gallery, New York, and Stuart Shave/Modern Art, London. The joke of combining two old exhibits to make one new exhibit is made funnier by the fact that no matter how much of Richard Tuttle’s art you bring together in one place, it still doesn’t feel like much. There’s an ephemeral quality, an elusiveness to his work. Even Tuttle’s artworks that are more physically substantial than the wire pieces have this elusive quality. 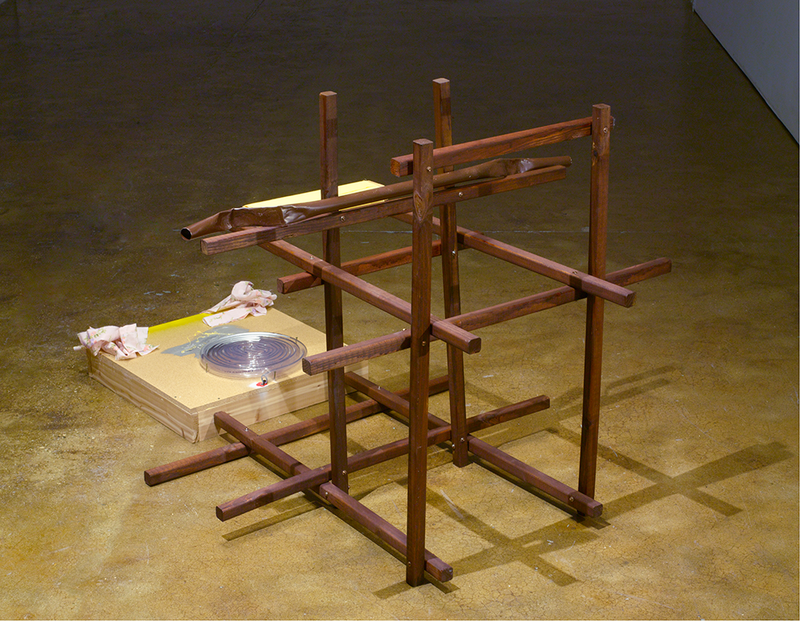 Systems XI (2012), for instance, looks like a simple wooden frame, stained dark brown and about the size of a deck chair. At first glance, it could be a chair. But the potential chair has no seat. Maybe it has some other use, perhaps in the printing process, or in dying and hanging fabrics, two activities at which Tuttle happens to excel? But no, it is none of those things. A padded cross bar on one side of the wooden structure suggest that you might kneel at this spot and rest your arms on the cross bar in an act of prayer. But the “base” of the structure, where you’d put your knees if you were going to kneel, is a little plywood box upon which sits a coiled up plastic tube and two bunched up rags. System XI is neither a chair, nor a drying rack, nor a prayer stool. But it manages to suggest all these possible identities and uses without actually being any of them. It is undeniably something. Yet it teeters very close to being, quite possibly, something to be found in someone’s garage and not art at all. This quality is what so annoyed Hilton Kramer. Hilton Kramer comes from a critical tradition in which art is supposed to declare itself definitely as art. 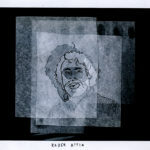 Kramer believed that art gets to be art by being true to its medium. This all goes back, more or less, to the thoughts of the great critic, Clement Greenberg. According to Clem and his followers (Kramer among them), art is truly art only when it fulfills its appointed role within its medium. Painting, for example, is form and color on a flat surface. So, a painting that fully embraces this fact, that cries out, “I am color and form on a flat surface,” is doing its job better than a painting that tries to fool us into thinking it represents three-dimensional space. That’s one of the reasons Greenberg so loved Jackson Pollock, the drip paintings make absolutely no bones about the fact that they consist of paint on a canvas. They declare that they are paintings without reservation. Whatever else they might mean as paintings, they are true to the medium. Same thing with sculpture. The medium of sculpture is, by definition of the medium, the arrangement of material (wood, metal, plaster) in a three-dimensional space. A sculpture, then, does a good job when it explores the attendant problems of weight, balance, shape, structure, perspective and so forth. A sculpture should draw attention to itself as a sculpture and not try to look exactly like, say, a person or a tree. The aesthetic experience of looking at works of art consists, for people like Hilton Kramer, in exploring the various “solutions” that a painting or a sculpture (or a work of art in another medium) presents in relation to its own specific medium. That’s why Kramer (and critics like him) tended to favor Modernist, non-representational art. By scrapping any need to “look like the real world”, paintings and sculptures in the Modernist tradition freed themselves to pursue the demands of their respective media most fully. Of course, Kramer wasn’t an absolutist on this matter. He was a great fan, for instance, of the American painter Fairfield Porter, who painted landscapes, portraits, and domestic scenes of American life. But Kramer loved Porter because, for all Porter’s “love of visual reality” (the love of how things actually look in the world), he had a “love of the medium” (the inherently flat and pigmented nature of a painting). 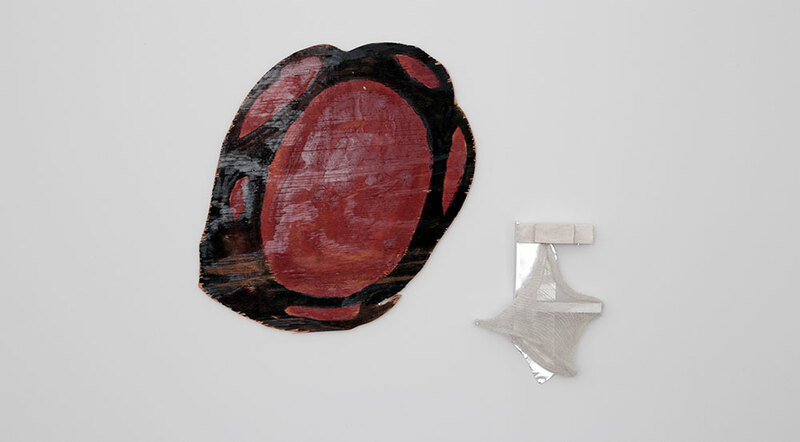 Left: Richard Tuttle, Fiction Fish I, 7, 1992. Graphite and ribbon on cardboard and graphite line. 5 x 4½ x 1&frac18; inches (12.7 x 11.4 x 2.9 cm), excluding line. Collection of Craig Robins, Miami. Right: Richard Tuttle, Looking for the Map 8, 2013–14. Fabric, wood, armature wire, Foamcore, paint, push pins, and straight pins. 93 x 48 x 48 inches (236.2 x 121.9 x 121.9 cm). Jacqueline Soffer, Nominee. Kramer thought the real threat to good art came not from those – like Fairfield Porter – who were still experimenting with representationalism in their work, but from Minimalism, which had emerged in force in the mid 1960s. Donald Judd, the famous Minimalist maker of art boxes, wrote a hugely influential essay in 1964 called “Specific Objects.” The first sentence of the essay declares, “Half or more of the best new work in the last few years has been neither painting nor sculpture.” As far as men like Hilton Kramer and Clement Greenberg were concerned, this was tantamount to heresy. From Kramer’s perspective, art cannot be art without medium. It is the medium that sets the condition for the performance. A work of art that hovers between media – like Judd’s series of glowing colored metal boxes on the wall – ceases to be, in any meaningful way, an artwork. 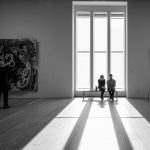 It was in the context of this ongoing debate about what makes art, art that Hilton Kramer stumbled across Tuttle’s exhibit at The Whitney in 1975. The show was doubly offensive to Kramer. It was not enough that Kramer been forced, for many years, to confront strange medium-ambiguous objects like Donald Judd’s boxes. Now he was being asked to look at medium-ambiguous objects that were also subject-ambiguous. At least Judd (Kramer must have thought) had the decency to make his stupid boxes boxy. Tuttle, by contrast, was making objects with very little form or substance at all, like the wire pieces, which hover not only in the space between drawing and sculpture, but in the space between existence and non-existence. Tuttle’s exhibit in 1975 caused great controversy in the art world, largely thanks to Kramer’s scathing review. 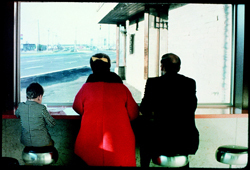 It is said that the curator of the exhibit, Marcia Tucker, was fired as a direct result. (Tucker went on to found The New Museum). But, as always, one man’s infuriation is another man’s delight. Most critics today largely agree that Tuttle is one of the great artists of his generation. In the years since Hilton Kramer threw his Tuttle tantrum, it has become usual to see all kinds of objects and experiences presented as art. A person sitting alone in a room can be art. A piece of white cloth on a white wall can be art. A museum label stuck on a wall next to nothing at all can be art. 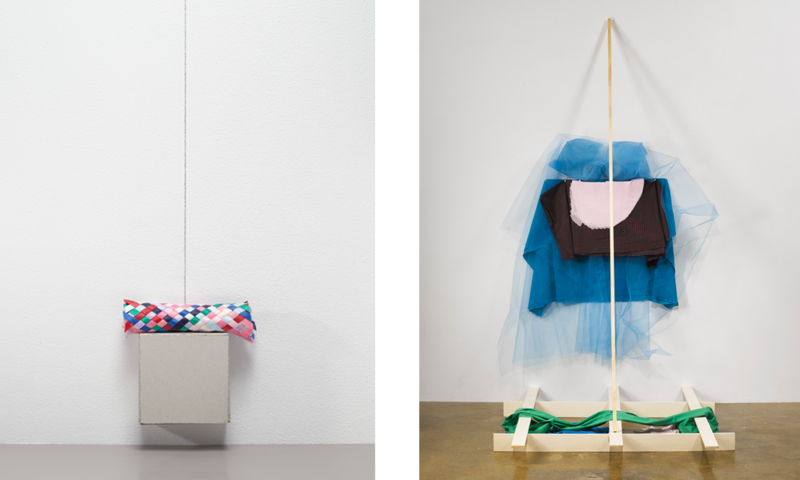 In the second decade of the 21st century, Richard Tuttle is far from alone in presenting minimal arrangements of textile as works of art. In comparison to some of the work seen at museums and galleries today, Tuttle is practically a maximalist. But I wonder whether the real pleasure of viewing Tuttle’s art comes from putting oneself back in the context of the late 1960s and early 70s, when the battles between High Modernists and Post-Minimalists over the soul of art still seemed important. We hadn’t yet decided that anything, truly anything, could be art. We were still nervous about art back then, still wondering whether aesthetic experience had certain boundaries that couldn’t and shouldn’t be overstepped. This nervousness gave Tuttle’s art, for all its subtlety, real crackle and fire. I was reading this poem and trying to figure out what it says about The Present when I noticed two rolls of masking tape sitting on the ground next to the artwork. The rolls of tape seemed to give the “sculpture” some balance and maybe also provide commentary on the cobbled-together, homemade quality of the piece, a quality shared by most of Tuttle’s work. Just then, one of the curators of the show, Magnus af Petersens, walked over to the artwork, smiled at me sheepishly, and grabbed the rolls of tape. “Somebody forgot to pick these up,” he mumbled. The rolls of tape were not part of the artwork. They were for making lines on the gallery floor beyond which museumgoers aren’t supposed to step. To someone like Hilton Kramer, this would have been the definitive, Emperor-Has-No-Clothes moment. When we don’t know, he’d have said, whether a couple of rolls of tape belong to a work of art or not, something has gone dangerously awry. I confess to my own moment of panic. What if I had written a piece about The Present, complete with a deep analysis of how necessary and brilliant are the rolls of tape? I would have been exposed as a fraud. Gradually, my fear subsided. I thought about the fact that I cannot produce a satisfying definition of what makes something a work of art. Hilton Kramer never produced such a definition either, nor did Clement Greenberg. They merely came up with arguments about what art should and shouldn’t be. The mysterious, indefinable nature of art is only scandalous to those who want, always, to be sure. Truly, The Present isn’t much as far as objects go. Maybe it shouldn’t be considered art. It is probably closest, in terms of the material from which it is composed, to being a piece of trash. I did notice, though, that wrapped up in string, it is like a present, like a gift. The generosity of Tuttle’s artworks lies in their ambiguity. They can be very many things, take on many roles. It is actually quite difficult, it suddenly occurred to me while looking at The Present, to make objects that hover so lightly between identities. Lead image: Richard Tuttle, Fiction Fish I, 7, 1992. Graphite and ribbon on cardboard and graphite line. 5 x 4½ x 1&frac18; inches (12.7 x 11.4 x 2.9 cm), excluding line. Collection of Craig Robins, Miami.